When will MEN learn to PEE IN the TOILET? It should have been a wonderful experience. It should have been 8 hours of pampered bliss. After months of anticipation, waiting for the 24th of June to roll around on the way to Cybermummy 11, I tentatively stepped aboard the 7.52 from Aberdeen to head down to London. I was hoping that the trip was going to be full of excited tweets, and maybe a little work along the way. 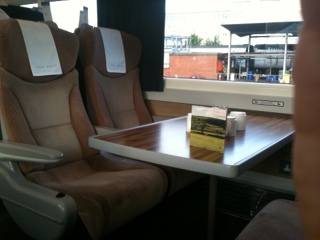 I splashed out and treated myself to first class tickets, and convinced myself that I was going to have a spectacularly wonderful journey, on the way to a spectacularly fantastic conference full of bloggers. My first impressions went really well, and the seating suited me perfectly. Being an insular blogging tweeter, my chosen single seat meant that didn’t have to make polite conversation based on get out moments of unintentional eye contact. I settled in for the 8 hour trip, and very smugly, I opened my laptop to begin a marathon tweeting session. All seemed to go well until I tried to connect to the free wi-fi. After trying on and off for 2.5 hours, the guard did eventually say that the wi-fi and the promised power in the socket was out of order. My heart sinks with the realisation that IT IS NOT GOING TO WORK AT ALL. The reason I chose first class and paid more mullah was for WiFi and POWER. AND to top it all, I didn’t have any books with me. Faced with the prospect of 8 hours on a train with very little, and patchy mobile signal, no power and a laptop that wasn’t going to last for an hour, I could only see the endless journey ahead of me while I stared out of the window. I religiously checked and rechecked the power point to see if it had come back on again. The woman and her daughter in the quad seat at the other side of me. eyed me sideways as I plugged in and out every fifteen minutes to see if it would come back on again. I’m sure they thought I had checked out of the closest hospital for the day. On the map when I chose my seat at the point of booked, it showed a toilet right next to the seat I had picked. I worried slightly that the door would open onto where I was sitting, and that a toilety smell would invade my long journey. I needn’t have worried, as the entrance to the toilet, was through the carriage doorway. I breathed a sign of relief and smugly smiled at my decadence. I gave up hearing the guards announcements by Edinburgh, but was pleasantly surprised on the way back up again on the Sunday, to be able to hear ALL of the announcements. I think some of it is a male thing. Deep voice + loud train = mumble, garble, burble. On the way down, I ran out of juice in my phone, my laptop, and my emergency back up phone battery. Whats a girl to do on a train that has no wi-fi, or power working, and was daft enough not to have anything installed worth reading on the phone? Yup, you’ve guessed it – she sits and refreshes the content on her screen every 30 seconds and wills the wi-fi into life – just to make sure she isn’t the only idiot on the train staring out of the window when technology is boop boop booping for everyone else. There was no wi-fi on the way back up the road again either, so I guess it’s just me who seems to be internetty challenged on trains, and I am grateful for the lovely Kathryn Brown from Crystal Jigsaw who played a game of cat and mouse with me while she planned waving a yellow flag from her farm, while I watched from the train (yup, I missed her). (ps, if you haven’t read her new book, you should, it’s fab). Kathryn – please forgive me for mentioning you in this post. After holding in the desperate need to pee for as long as possible, the time finally came when I had to face the dreaded toilet. The bitter disappointment I felt when I entered the cubicle, will stay with me for life. There, like a vision of misery, was a soaking wet floor, with lots of bits of someone else’s toiletry paper adorning the floor like a decorated tapestry. Now, forgive me for being a woman with too much expectation from others, but is it really too much to ask, for men to PEE IN THE TOILET. I have to say, that the biggest no no for me would be when I put down a toilet seat, and am then confronted with PEE LINES. NO human should be subject to PEE LINES. Am I making myself totally clear? And if they do pee on the toilet, or miss the pot altogether is it too much to ask for them to CLEAN IT UP AFTERWARDS…………? Being the slightly obsessive toilet freak that I am, I take toilet roll from holder, and try to squirt a healthy dose of soap from the dispenser. My bladder is going into overdrive, and the need to pee overtakes my need to sit on a sparkling like new toilet seat, but while I am in there, another train dweller begins to batter on the toilet door, and whang at the handle, and as I get ready to venomously spew out “whats your problem”, I open the door in a rage, to look down at a smiling junior battering ram. I laugh at the silliness and I ignore the pain pressing on my bladder, walk out of the toilet, and head back to my seat. I take my hand sanitiser and march back to wait in the now queue to the loo. At this point, the man opposite with serious liquid envy seems to snigger as I pass. I straighten my back and swish my hair with a flourish to get my own back. A healthy dose of santisier, and I once again run back to my seat to grab the make up wipes that hide in the bottom of my never ending laptop bag. 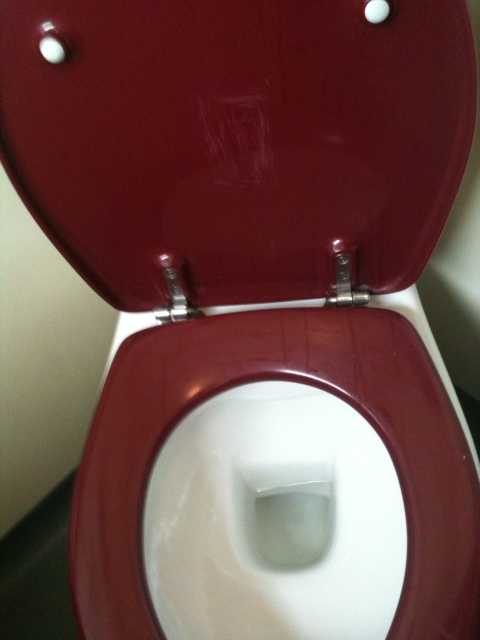 When I’m done, the toilet seat ends up as shiny as a new pin. I ignore the “water” on the floor, and try to tell myself that it’s the result of drip dry hand shakers. The piece of sodden loo roll scrunched up with what looks suspiciously like fresh blood fills my shoes with shaking feet. I seethe as I consider the fact that somebody needs to open up a school that deals with teaching men to pee straight. Women in their millions would book their men onto it, and we’d all live happier at home, on trains, and enjoy friends coming to visit. 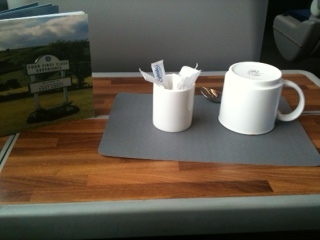 With hours of a train journey still to go, a new obsession takes over. Every half an hour, my body decides to make me suffer with the necessity to visit the room of a million smells. Even Mr fluidly challenged begins to think it’s funny. Every male that passes me on the way to the loo, I eye up with daggers, convinced that the possibilities will make them pee straight in the loo. Will MEN please learn to PEE IN the TOILET ! « Who will take a leap of faith with me? Make a difference. I too have a phobia of public toilets. I despise them with a passion and the thought of using a toilet on a train really turns my stomach. With a 3 year old it’s now virtually impossible to avoid them. I have been into ladies public toilets and sometimes they are just as bad. Revolting. Oh its revolting isn’t it and train toilets seem to be particularly bad don’t they. I dread needing the toilet if I’m on the train – perhaps they should have a ladies and a gents. I am thinking that maybe I should take to the garage and develop and new and ground-breaking guillotine toilet, with an inspector gadget-esque arm that appears holding a small cleaver if any moisture is felt on the toilet seat. Haha, I like your style. When you get it to market, give me a shout. First of all, thank you for the mention to which of course I don’t mind!!! We’re going down to Essex in August and I’m not looking forward to the train journey at all. 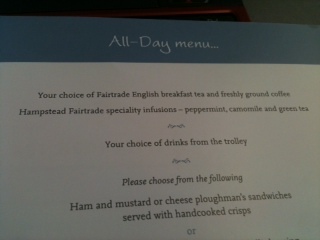 I’ve booked standard class so now I’m expecting the worst! I haven’t a clue why men can’t pee straight. I think half of them are looking round while they’re doing it and have no idea that the rush of waterfall is missing the target. Just my theory. Not that I’d ever want to check that I’m right. I think it depends on the line and what time of day. I can imagine a busy train, by the time it gets to you being a very choice floor. Make sure you have hand sanitiser and wipes is all I can say about train travel. ooh, and it helps to spray some perfume on your sleeve so you can take a whiff if the powder room is just tooo unpleasant on a long journey.